Whether you are new to APIs or an experienced API professional, some tips, tricks, and best practice reports cannot hurt. We describe some of the most common challenges in API Design, API Security, API Strategy and API Business. And if these challenges sound familiar, don’t worry. We propose a best practice solution. Sign up below. The first email will address API Security with OAuth. If you are trying to get your head around OAuth, and you are getting confused, you are definitely not alone. 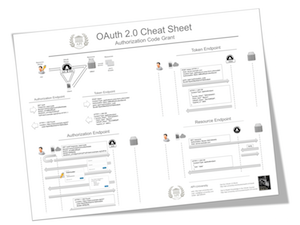 This is why we have created the OAuth Cheat Sheet. And we will share it with you for free, in the first email you get. Sign up today. At API-University we believe that APIs are the building blocks of digital transformation. This is why we create books, courses and trainings on APIs. To help you succeed in a digital world. If you’re in charge of initiating, designing or running an API initiative, you’ve got a big responsibility. It isn’t easy. Building APIs your consumers will love is easier said than done. We know what you’re up against. We have built API-University to lend a hand. We make our experiences, best practices, lessons learned and practical know-how available to help you stay on top of it all. Here you get what you need to build APIs that your consumers love. We’re 100% committed to making API-University better every day. If you have any questions, or there’s anything we can do to make you successful, please get in touch. Thank you! You got the knowledge through our courses or books, so take the next step and apply for a better job in the API space. We have the largest job database focused on API-related jobs because we want to help you find the API job that is right for you and makes use of your unique skill set. Search for API keywords (such as REST, GraphQL, API Security or OAuth) and by location. But be prepared and read up before your interviews. Skill Interface vs Skill Service – What is the Difference? Copyright © 2019 API-University. Powered by WordPress. Theme: Spacious by ThemeGrill.